Let’s examine Peirce’s second example of a disjunctive term — neat, swine, sheep, deer — within the style of lattice framework we used before. Hence if we find out that neat are herbivorous, swine are herbivorous, sheep are herbivorous, and deer are herbivorous; we may be sure that there is some class of animals which covers all these, all the members of which are herbivorous. (468–469). Accordingly, if we are engaged in symbolizing and we come to such a proposition as “Neat, swine, sheep, and deer are herbivorous”, we know firstly that the disjunctive term may be replaced by a true symbol. But suppose we know of no symbol for neat, swine, sheep, and deer except cloven-hoofed animals. (469). 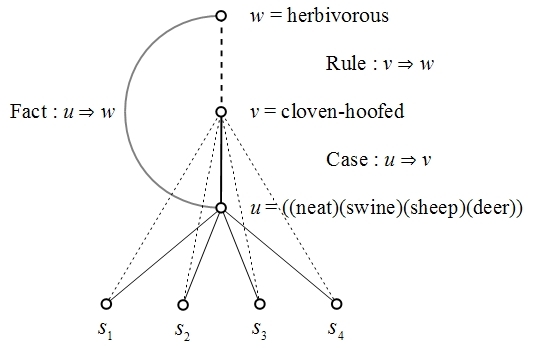 This is apparently a stock example of inductive reasoning which Peirce is borrowing from traditional discussions, so let us pass over the circumstance that modern taxonomies may classify swine as omnivores. Figure 2 diagrams the situation before us. Here we have a situation that is dual to the structure of the conjunctive example. There is a gap between the logical disjunction in lattice terminology, the least upper bound (lub) of the disjoined terms, and what we might regard as the natural disjunction or natural lub of these terms, namely, cloven-hoofed. Once again, the sheer implausibility of imagining the disjunctive term would ever be embedded exactly as such in a lattice of natural kinds leads to the evident naturalness of the induction to namely, the rule that cloven-hoofed animals are herbivorous.